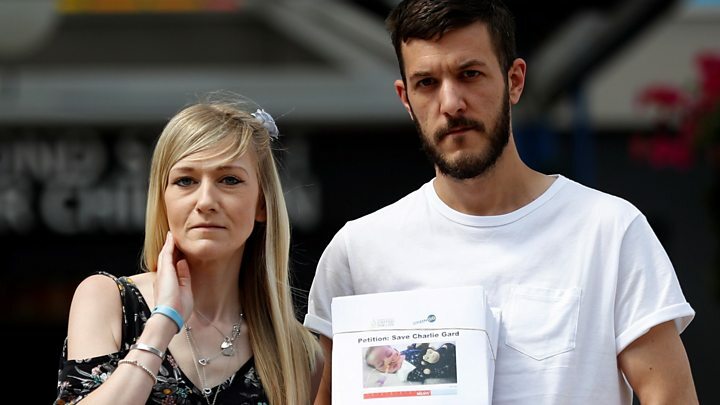 The parents of Charlie Gard have joined supporters to deliver a petition to Great Ormond Street Hospital calling on doctors to allow the sick baby to travel to the USA for treatment. The petition has been signed by more than 350,000 people. The 11-month old boy's case is due to return to the High Court on Monday after the hospital said it had seen claims of new evidence relating to the potential therapy. His family said the fight was not over. Speaking outside the hospital, Charlie's parents, Connie Yates and Chris Gard thanked their supporters and the media for sharing the story of their 11-month-old son worldwide. The couple both in their 30s and from Bedfont, west London, want to take the baby to a hospital in the US for experimental treatment, but lost a lengthy legal battle after judges ruled in favour of doctors at GOSH. GOSH doctors argued the therapy would not improve Charlie's quality of life. Mr Gard said they needed a specialist in Charlie's condition and therefore need to send him to America to "give him the chance he deserves." Ms Yates added: "We have seven doctors supporting us from all around the world. "There is up to 10% chance that this treatment may work and that's a chance worth taking. "He's our son, he's our flesh and blood. We feel that it should be our right as parents to decide to give him a chance at life." She added: "There is nothing to lose, he deserves a chance." It comes after GOSH said on Friday it had applied to the High Court for a fresh hearing "in light of claims of new evidence relating to potential treatment for his condition". Clinicians from the Bambino Gesu paediatric hospital's neurosciences department said tests in mice and patients with a similar, but not the same, genetic condition as Charlie had shown "dramatic clinical improvements". Charlie inherited the faulty RRM2B gene from his parents, affecting the cells responsible for energy production and respiration and leaving him unable to move or breathe without a ventilator. Charlie's case will be heard by Mr Justice Francis on Monday at 14:00 BST, according to a High Court listing.